‘Til Midnight At The Nasher is back and better than ever, with a performance every month through November. Check out the full lineup and everything else you’ll want to know about the series below. 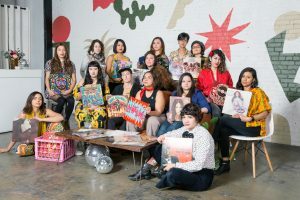 Plus, take a closer look at some of the artists who will be hitting the stage at the Nasher Sculpture Center garden this summer and fall. 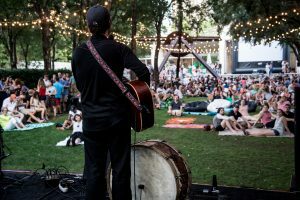 The Nasher’s yearly series ‘Til Midnight At The Nasher is back for another season of live music, art, food and films, taking place the third Friday of every month from now through November. 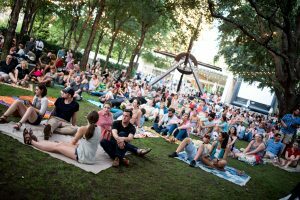 This free event features local and national bands and musicians followed by film screenings, all surrounded by the Nasher’s world class modern and contemporary art collection. These events start at 6pm and run ’til midnight. This is an outdoor event taking place at the Nasher Sculpture Center garden, 2001 Flora Street, Dallas, Texas 75201. Plan ahead and order a picnic basket from Central Market to enjoy during the event or check out the cash bar, street tacos from Wolfgang Puck Catering and popsicles from Steel City Pops. Picnic dining reservations are available until 4pm the Wednesday before each event by calling the Central Market Lovers Lane catering desk. The Nasher does not allow outside furniture, food or drink. In the case of inclement weather, the event will be moved indoors and carry on as usual. Long-running instrumentalists This Will Destroy You will celebrate the tenth anniversary of their eponymous 2008 studio album by performing their record in its entirety. The band will also play the coveted Young Mountain record in full. 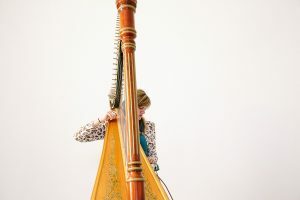 Combining two ancient aspects of music — the voice and the harp, respectively — with contemporary technology, Julianna Barwick and Mary Lattimore are noted for their unusual approach to looping effects. Barwick has stunned audiences worldwide with a sound that’s been described by the New York Times as “churchly and vaguely Renaissance, but also very now.” The former Pew Center for Arts & Heritage fellow is one of the most sought-after harpists in the world, collaborating with the likes of Jarvis Cocker and providing musical accompaniment to artist Nick Cave’s “soundsuits” for the Grand Central Station’s 100th Anniversary in New York. Mary Lattimore, photo by Jackie Lee Young. Tess Roby’s live act includes her brother Eliot Roby on guitar. Having premiered her “Ballad 5” single on the influential Dallas music website Gorilla vs Bear last May, Tess Roby is embarking on her first headlining tour this year. Roby’s single was released by Italians Do It Better, the internationally-acclaimed record label that has had a significant impact on the synthesizer-heavy sound of both dance music and soundtracks of the past decade. Roby’s sound fits neatly into their established roster. Negative Gemini is American songwriter, singer, and producer Lindsey French. After moving to Brooklyn in 2014, the Virginia-native released herself-produced debut album Body Work, for her own record label (100%Electronica) earning early comparisons to the likes of Hope Sandoval and Gwen Stefani. With its unique blend of underground dance beats and pop hooks, Body Work quickly found itself the darling of many music publications, garnering critical acclaim from prominent media publications like MTVnew, Resident Advisor and Fader. Already established as a strong female presence in the New York electronic music scene, Negative Gemini’s new EP Bad Baby seeks to write timeless and memorable music on the fringe of pop. Exploded View is led by German-English singer Anika Henderson, a former political journalist who made her name under her solo project, Anika. The artist became well-known for her radical reworking of the music of Bob Dylan, The Kinks and Yoko Ono. Her previous recordings were in collaboration with Geoff Barrow of Portishead. She met her new band in Mexico City and their combination of disco beats, punk and spaghetti western guitar takes Henderson’s already original sound into completely new territory. Exploded View, photo by Andrea Martinez. Chulita Vinyl Club, photo by Whitney Devin. *Artist biogrophies provided by Nasher Sculpture Center. For more information and updates on ‘Til Midnight At The Nasher, visit the Nasher Sculpture Center’s website.